In 1861, William Farr, Superintendent of Statistics for the General Record Office (GRO), stated in the 24th Annual Report of the Registrar General: ‘Young children drink scalding water out of the spout of the tea kettle, or fall into scalding water. This happens often in the lower classes, when the mother is out at work, and the young children are left home alone. [He goes on to say] The means of obviating danger are evident’. 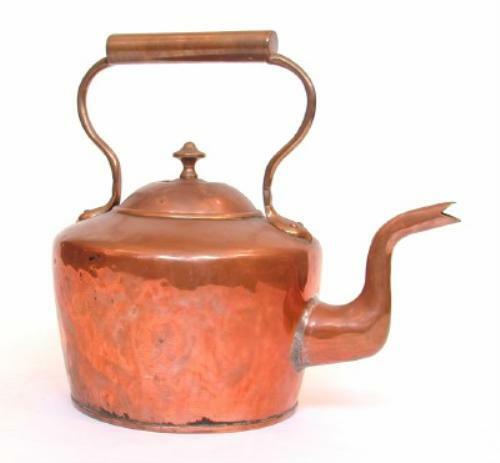 The tea kettle was central to working-class domestic life in the Victorian period. In his investigation of dwellings of the poor in East Anglia and North-East England, Adrian Green remarks that the tea-kettle ‘was more of an addictive necessity than a luxury’. 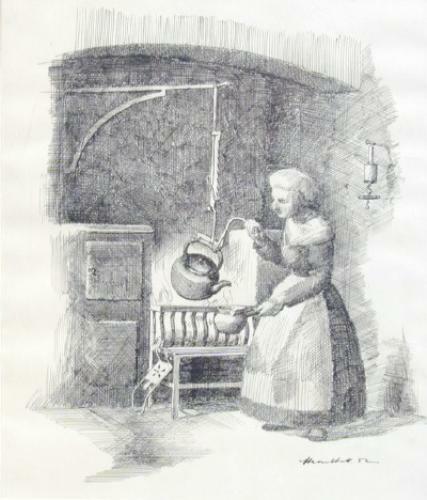 At an inquest held in Ipswich, in 1855, it was noted that the tea-kettle ‘was always kept boiling by the children’; low firegrates placed the kettle within easy reach of children, while in some instances kettles were attached to a lever for ease of pouring (as seen in the image below). This also meant that the tea kettle was all too frequently in the reach of small and inquisitive hands unaware as to the danger of boiling water. © Museum of English Rural Life, University of Reading. MERL 85/67. In Ipswich and the Liberty of St. Etheldreda (East Suffolk), 1840 to 1900, a total of 43 children are recorded as having died as a result from scalds resulting from accidents with kettles and saucepans, including a number of cases of young children drinking directly from the boiled kettle. The majority of these victims were just one or two years of age. The same year as William Farr’s remark, 20-month-old Mary Ann Hunt of Debenham, Suffolk, died as a result of drinking from the kettle. The coroner’s inquest, reported in the Ipswich Journal, recorded that Mary Ann was with her mother who ‘was preparing dinner and [on] turn[ing] round to get some bread, [Mary Ann] attempted to drink from the kettle standing on the fireplace […] The inside of her mouth and throat were so much scalded, that she died from the effects the following day’. Similarly, the following year, 18-month-old Henry Smith of Ipswich, oblivious to the danger of the boiling water, also took an opportune moment to drink from the kettle. The Ipswich Journal reported: ‘[a]bout noon on the previous day, Anne Smith, mother of the child, was in the front room of the cottage with [Henry] and some of the other children. She was making up the fire, and [Henry] was by her side. On turning her head towards the child, she saw him take his mouth from off the spout of the kettle, which was boiling on the fire […] The child died at half-past 10 o’clock in [that] evening. While just over a year later in Melton, Suffolk, 16 month-old Alfred Barrell’s mother was washing in the backhouse when she heard screams coming from the house. Upon running in, she found Alfred ‘in the middle of the back-room […] on ask[ing] what he had done, he put his finger on the spout of the kettle standing on the fire-place. The inside of his mouth was much scalded; he died the following day. Notably, it can be observed in these cases, that such accidents did not occur while mothers were out at work, as suggested by Farr. Instead, in Suffolk at least, the mother was often in the same room and, in some cases, even right next to their child at the time of the fatal incident. Assistance from an unwitting sibling also led to tragedy. In Ipswich, in April 1855, two-year old Ann Sadd died after ‘being accidentally scalded by drinking boiling water from a tea-kettle’ standing by the fire. Unable to drink from the heavy kettle herself, Ann’s seven-year old sister, ‘having taking hold of the handle […] inclined the kettle forward’. Scalding was not the only associated hazard of the kettle. With many poorer households boiling kettles on the open firegrate, slightly older children (especially girls in their flammable clothing), either delegated the task of boiling the kettle or merely playing house, were at risk of being burnt. In Brightwell, Suffolk, in 1841, the harrowing case of eight-year-old Charlotte Dillerson’s death came before St. Etheldreda’s coroner. The Ipswich Journal describes that Charlotte’s clothes ignited ‘while she was attempting to put the kettle upon the fire’. Alone at the time of the accident, her father and mother being at work in the fields and the cottage being ‘in a lonely situation’, ‘[Charlotte] ran nearly a mile across the fields to Mr Everitt’s without any clothing whatever, except her socks and high [shoes], the whole having been burnt off her back’. While, in Framsden, Suffolk, in 1863, Emma Woods, aged seven years, was ‘terribly burnt’ when ‘her sleeve caught fire in getting the kettle off the fire to put some water into her little sister’s food’. Her mother was, at the time of the accident, assisting an ill neighbour next door. Despite medical attention, Emma died two days later. There still remains the important question as to young children’s motivation to drink from the boiling kettles. District Nurse, Margaret Loane, suggested that, oblivious to its dangers, thirst drew young children to the kettle and advised mothers to ‘[leave] cold water within easy reach so that thirst would not tempt a child to grab a kettle’. However, reasons behind young children’s desire to drink from the tea kettle remain difficult to establish. Adrian Green, ‘Heartless and unhomely: dwellings of the poor in East Anglia and North-East England’, in Joanne McEwan and Pamela Sharpe (eds. ), Accommodating Poverty: The Housing and Living Arrangements of the English Poor, c. 1600-1850 (Basingstoke, 2011), p. 86. Ipswich Journal, 7 Apr 1855, p. 3. Ipswich Journal, 28 Sept 1861, p. 4. Ipswich Journal, 8 Mar 1862, p. 7. Ipswich Journal, 14 Feb 1863, p. 5. For more details on the whereabouts of mothers at the time of their children’s accidents see: Victoria J Holmes, ‘Dangerous spaces: working-class homes and fatal household accidents in Suffolk, 1840-1900, Essex Ph.D. 2012. In addition, Pamela A. Sambrook ‘Childhood and sudden death in Staffordshire, 1851 and 1860’, in Philip J. Morgan and A.D.M. Phillips (eds.) Staffordshire Histories: Essays in Honour of Michael Greenslade, Vol 19 (Keele, 1999), pp. 217-252, also has similar findings. Ipswich Journal, 20 Nov 1841, p. 3; SRO (Ipswich): HB10/9/55/43 Inquisition on the Death of Charlotte Dillerson at Brightwell, 15 November 1841. Verdict – accidentally burnt to death. Ipswich Journal, 31 Jan 1863, p. 5. Cited in Ellen Ross, Love and Toil: Motherhood in Outcast London, 1870-1918 (New York, 1993), p. 181. Please do not reproduce the content of this blog in print or any other media without permission of the author. This entry was posted in Blog and tagged accidental death, Coroners Inquests, domestic life, kettle, Margaret Loane, Newspapers, scald, Suffolk, tea, Victorian era, William Farr. Bookmark the permalink. Reblogged this on Victorian Studies Centre.